It’s been a while since I last posted anything here. Two years and five months to be exact. The last time I posted, The Turku Synth Club probably numbered about a 70 or 80 synth enthusiasts, but at the moment there’s 365 of us. One synth-freak for every day of the year. This fall we held a big synth meeting and we’ve been spreading the message by having a course on synth basics for land lubbers in the local Turku library. Wow! Never would’ve believed this would happen when the four of us met for the first time to have a beer and talk about our hobby with fellow synth-heads. This time I’ve dug out a real gem for you. As I probably told earlier, a local radio station decided to get rid of all their vinyl and I went there and bought approximately 400 7″ singles for my collection. There’s all kinds of weird stuff but this particular single is totally in it’s own league. A band called Freelance with another name Kätkä & Pietikäinen written underneath it. Basically the band consists of a multitalent musician Ippe Kätkä, whose job description on the record cover is – songs, arrangements, synths, machines, percussion and production – and a poet of somekind Seppo Pietikäinen whose area of expertese is – lyrics, spoken vocals, ideas, making coffee and taking care. On paper that doesn’t amount to much, but on record the combination is killer. The song I uploaded is the b-side of the single Tanssitaan Mammuttiaikaan (Let’s Dance Back To The Mammoth Age) which is not the greatest song on the album. But the b-side is pure genius. As you can probably make out, it’s called Sinä Olet Helmi (You Are A Pearl) and it sounds like it could’ve been made by Pori-dwelling krautrock-folk-masters Rättö & Lehtisalo. It also makes me think that maybe Dxxxa D has been listening to this song to get the inspiration to make his own stuff. 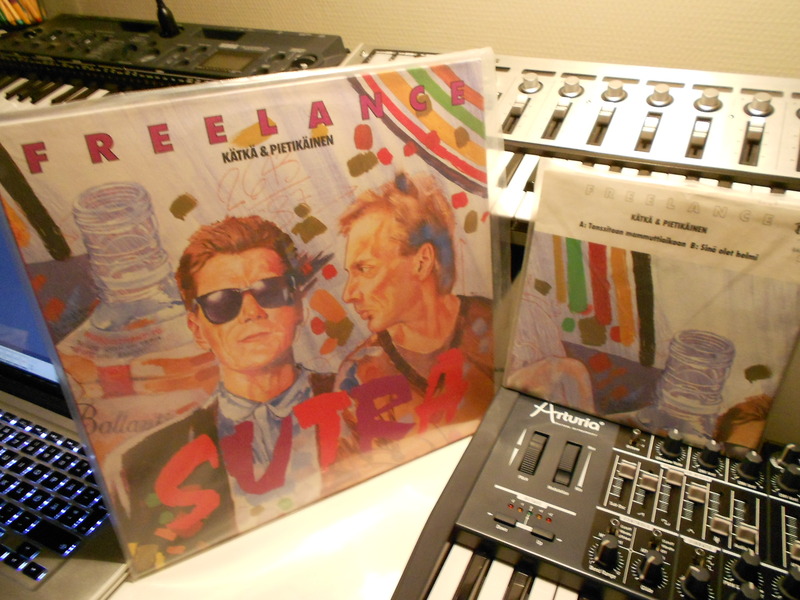 The single is on Bang Trax a legendary Lahti-label which put out a lot of really interesting stuff in the late 80’s. Keep your eyes peeled for that logo in second hand record shops. It’s from 1988 but it could be from 2088 as well. As soon as I heard the single I had to get my hands on the full length album and luckily found one copy lying around in a Helsinki record shop. I ordered it and the album is filled with weird, excellent music that’ll make you laugh out loud and sigh in amazement. It’s also got some really high class guest stars like Dave Lindholm on guitar and Henk Hofstede (of The Nits) on backing vocals. And on top of that, possibly one of the best album covers done in Finland in the eighties. Sit back and enjoy. Maybe I’ll post something else from the album in the near future.